Tuesday, June 11, 2013. The tide comes in. The tide goes out. Deep breaths. Serenity now. 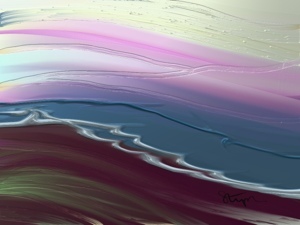 I doodled this image on my iPad using Artrage 3. Awesome Steph. If your doodles produce this, when you do some serious stuff, it must be mind blowing. Cheers. You are too kind. I only doodle. I don’t really create anything too seriously at least on a personal level. I work and have a family. My doodles are simply a release valve of sorts. I forgot to ask. How are you otherwise? I’m well. I hope you are well. I enjoy your blog posts. They always make me think. I am delighted that you read my blog posts. I will be more so if you could leave comments and read my responses. Some of them become big long discussions with many commentators taking off into orbit!